A top quality high opacity emulsion based on unique AkzoNobel technology which gives excellent coverage and application as well as a durable finish which lasts everyday living. Where condensation is a problem e.g. 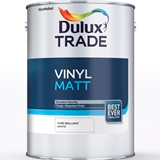 some kitchens and bathrooms, use Dulux Trade Diamond Eggshell. Suitable for all normal interior wall and ceiling surfaces. *Compared to previous formulation pre-March 2014.